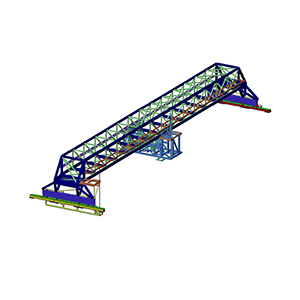 FEA-Solutions (UK) Ltd - Finite Element Analysis For Your Product Design | 375: Crane for Nuclear Facility Complex beam and plate element model of crane subjected to modal analysis, seismic and static loads, analysed for various configurations (crab and carriage positions, masses). Iterative optimisation of the structural sections performed. Project included analysis of rail support beams.